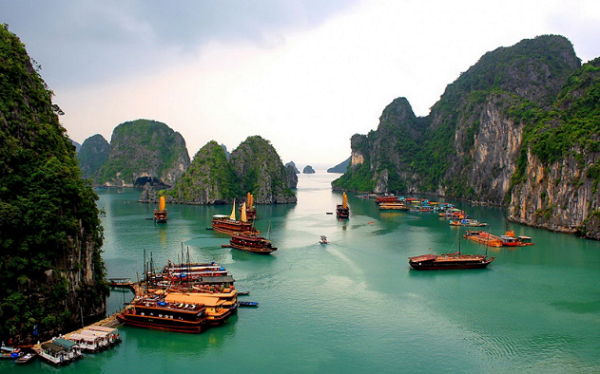 Besides taking a traditional junk boat cruise around spectacular Halong Bay to discover the limestone formations, natural grottoes and floating villages, swimming, and diving on the emerald green waters of Halong Bay are the favorite activities of many tourists. In addition, you also discover beautiful caves such as Sung Sot Cave, Thien Cung Cave, Dau Go Cave, and so much more. Kayaking is other water sports that you can indulge in. Paddle out to the calmer, less-visited corners of the bay, which the bigger boats cannot maneuver, now it’s time for you to explore the beauty of the bay up close on a kayaking adventure. 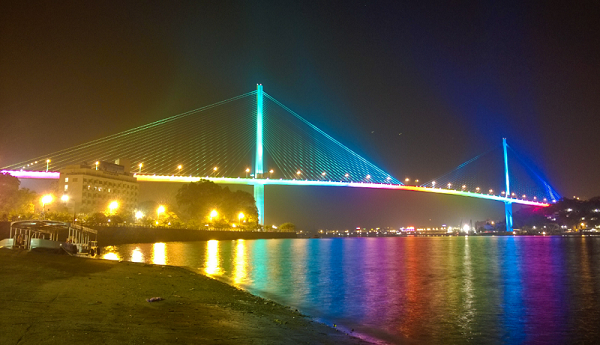 Apart from the daytime activities, Halong Bay at night has its own fantastic beauty. 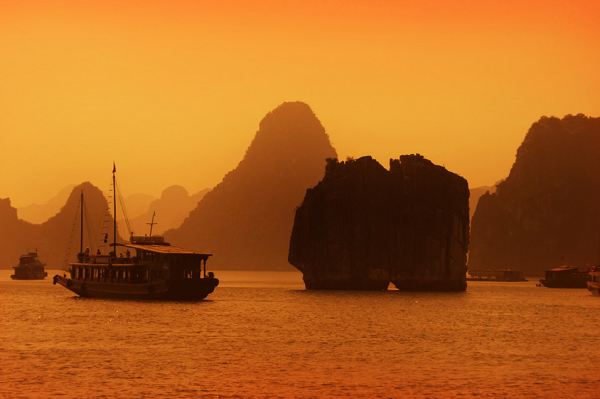 Exploring the beauty of Halong at night is as exciting as in the daytime. There are a lot of things for you to do. Here are top 4 things that you must try. Let’s check them out. An experience to travel around Halong by Xích Lô or a horse-driven vehicle in the evening and enjoy the sea atmosphere and the unique leisurely feelings that it brings. What an amazing moment ever! You can come to Bai Chay bridge at dawn, take the elevator up, all beauty will be in your sight, including fabulous sunset. Besides, there are several bars in Halong, most crowded in the evening. So you can get there and enjoy the vibrant atmosphere at night. 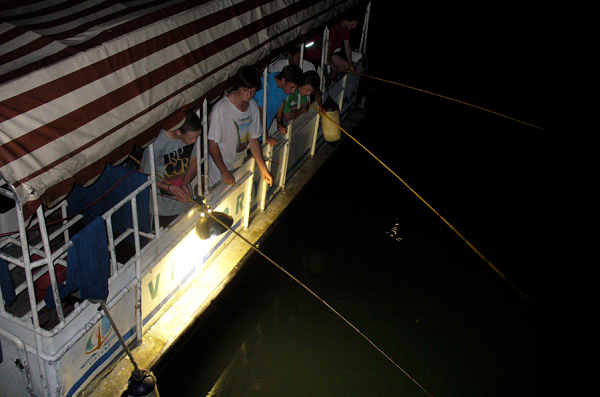 Squid fishing on Halong at night is an interesting activity which tourists must try at least one time when staying overnight at the cruise in Halong Bay. You will sit on the boat with a fishing rod and enjoy a peaceful night. You will be supplied with essentials to catch squids. This is a perfect time to enjoy Halong Bay by night. At night, the surface of the sea water is sparkling with the reflected light from those cruises that anchored in this bay. You can enjoy your fruit of labor with the dishes made from the squids that you caught. You will immerse yourself in the dramatically scenes, fresh squids, and cold beer. Perhaps you can go to sleep because you do not want to miss any single minute night – time at here. Have you ever had a dinner in a cave? Well, coming to Halong, you can have it. Cave dining is special dinner which is offered by cruise operators. Instead of having a dinner on the boat or at the restaurant, your dinner will be set up in the cave. 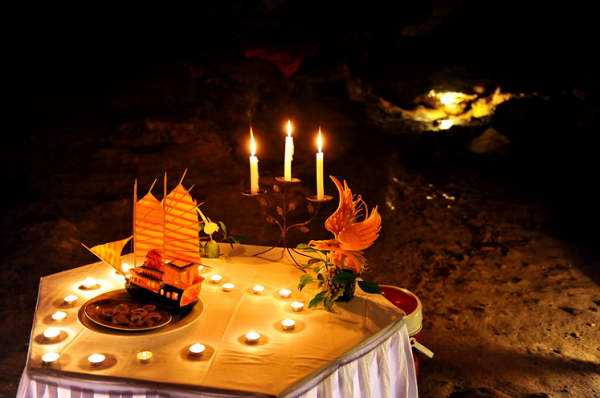 The light of hundreds of candles, delicious food, the beautiful cave will bring you romantic and fancy dinner. It will be an unforgettable dinner of your life and the best overnight that you’ve ever had. 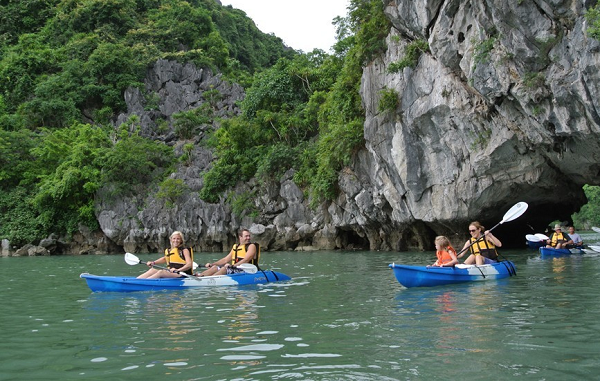 These are only top 4 things that you can do when you stay overnight in Halong. But, you can discover many other interesting things. 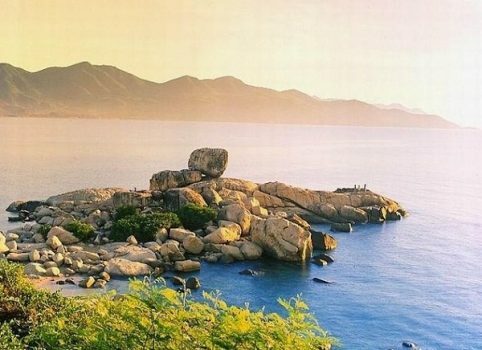 Just enjoy and have beautiful moments in this heavenly bay.